After World War II the United States and the USSR divided Korea up into two countries, with the USSR occupying the north and the USA occupying the south. 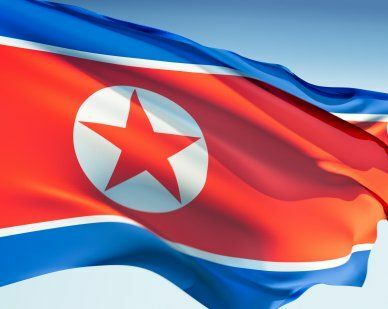 The North Korea flag was adopted in 1948. The blue stripes of the flag represent sovereignty, peace and friendship. The red represents communism and the patriotism that came from revolution. White is the traditional color of purity. The white circle also represents the yin and yang symbol of the culture. The red star symbolizes communist philosophy. Before the separation they used the flag currently used by South Korea. Our top-quality North Korea flags conform to all official specifications. Emblems and designs are executed with the highest possible degree of accuracy in regard to detail, color shades, placement and proportion to flag size.